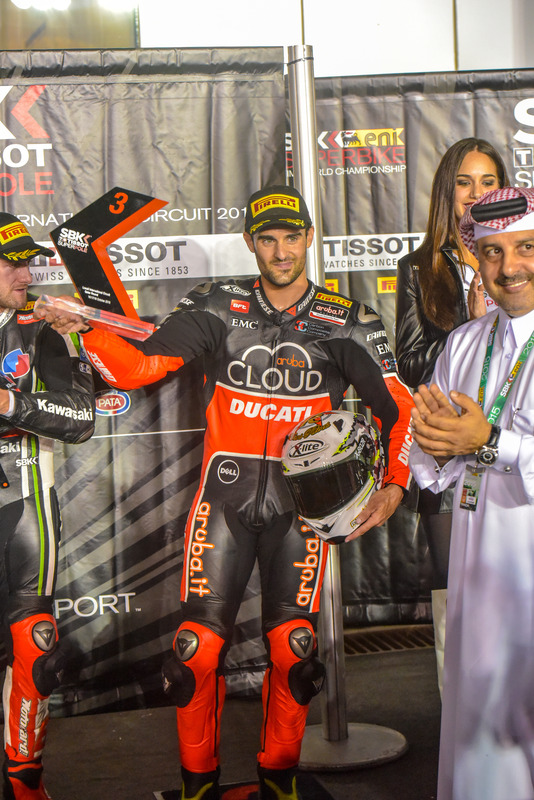 Doha (Qatar), Saturday 17 October 2015 – the Losail International Circuit in Qatar played host to a hard fought Superpole this evening. In the final qualifying session of the 2015 season, the Aruba.it Racing – Ducati Superbike Team riders Xavi Forés and Chaz Davies battled it out against their rivals to earn third and fourth position respectively on the grid for tomorrow’s SBK races. The third and final timed practice session took place at 6pm local time. Davies focused his attentions on the final split, a sector where he was losing a little time yesterday. Able to make an improvement in terms of both said section and lap times, the Welshman closed in sixth place, having obtained a best time of 1’58.460. Forés made the most of this final session to make final preparations for the Superpole, having lost precious time yesterday after a crash in session one. Unfortunately yesterday’s fall left him with serious bruising on his right leg but despite this setback, the Spaniard was able to improve slightly on yesterday’s time with a fastest lap completed in 1’58.460. Both Aruba Ducati men therefore qualified directly for Superpole 2, in sixth (Chaz) and eighth (Xavi) position. Superpole 2: having completed a first lap on the race tyre, both Davies and Forés were straight back out on the qualifying solution. The Spaniard, having made significant changes to the set-up of his Panigale R together with his team just prior to the Superpole, found the confidence that he’d been missing and, pushing hard with the qualifying tyre, projected himself into third position, earning a place on the front row of tomorrow’s race grid. It is the first time in his Superbike career that Forés qualifies in the top three. Chaz unfortunately lost a few tenths on the qualifying tyre due to some vibration issues at the rear of his bike that prevented him from completing a very fast lap. His best time, a 1’57.406, positioned him fourth at the session’s end, meaning that he will line up on row two for tomorrow’s two 17-lap races.